There seems to be rather a plethora of quality European hard rock acts around at the moment, and this month sees the return of German/Dutch quintet Wicked Sensation, reformed last year by founder Micheal Klein. He’s brought original vocalist Robert Soeterboek back into the fold, along with Punk Cream 69’s Dennis Ward, who plays bass and has no doubt had a hand in the production (although it doesn’t say either way on my info). Six years after their last album, it seems that the time is right for a band with a powerful melodic backbone, but it remains to be seen if they can again stand out from the pack. Unsurprisingly, Wicked Sensation trot out the type of melodic hard rock favoured by the likes of Dokken and Whitesnake, albeit with a European tinge. There’s plenty of melody about, and this results in some great songs, such as ‘Lonely Is The Night’ and ‘Fistful Of Dreams‘. There’s also the very catchy ‘My Turn To Fly’ which features some guest vocals by Andi Deris, and these songs lead the way when it comes to melodic rock with a gritty edge. Guitars are very much favoured over keyboards throughout, and Dirk Bruinenberg’s drums are also pushed nicely up in the mix, giving ‘Crystallized’ a hard, solid foundation. Okay, so there’s the obligatory ballad in ‘The Love I Used To Know’, but it’s not too bad. Vocalist Soeterboek has a whiff of Coverdale about him, and sings very well without an obvious accent although he rarely seems to be required to stretch his vocal chords. I like his voice, which suits the material, but he doesn’t stand out any more than he has to. 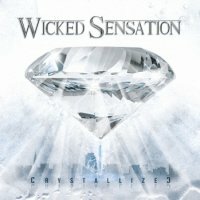 As a piece of melodic hard rock, ‘Crystallized’ ticks all the right boxes. There’s good songs, good production and no weak links musically. It fitfully crosses the line the divides a good album from a great one, and will garner a lot of affection from fans of the genre. Certainly worth some of your time if you like your melody backed up with bone crunching guitars, but beware of the fact that it brings nothing new to the table, even though it’s still a hearty meal in itself.